A few weeks ago we took a trip to Bellingham, WA. Before we went, I researched the area for off-leash dog parks. The search appeared to yield a lot of options. As it turns out, the majority of the spaces listed are just regular parks where you can legally walk with your dog off leash though. It is unusual, and a special treat for those with a dog that sticks by their side, to have so many urban spaces where you won’t get a ticket for not leashing your dog. However, I am not one of the people that benefits from this. Chester and Gretel need to be on a leash if they are not in an enclosed area. Out of the all of the areas listed, only one, Lake Padden, has a traditional fenced off-leash area. Since our snowshoeing and hiking adventures didn’t work out, we decided to stay in the City and go check out the park. 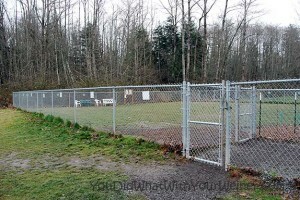 To get to the off-leash area, you use the east entrance into Lake Padden Park. Drive to the end of the road where the sports fields are and the dog park is on the left. The gravel lot by the off-leash area looked like it would only hold about 10 cars but there are many others nearby. The surrounding paved lots provide about 25 additional parking spaces and there are more available if you are willing to walk a bit. There were plenty of open parking spaces when we were there but, from experience, I know that this is a very popular park in the summer. When the weather is nice I would expect parking to be a little tight. The fenced enclosure was bigger than I expected. I don’t know much about football but I would guess it was almost the size of a football field. A small section of it was fenced off as a small dog area. There is one double gate to enter the park. After you enter into the first gate, you have the option of taking a second gate to the right into the big dog area or the gate to the left into the small dog area. The surface is dirt with a thin covering of grass and weeds. The most used parts of the big dog area were somewhat muddy. The back half of the main area and the small dog area still had most of their grass covering – presumably because they don’t see as much use. 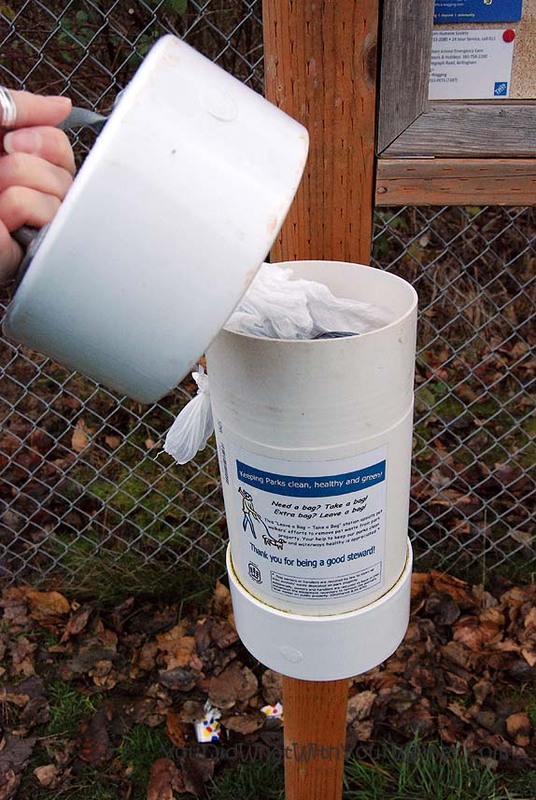 Amenities near the off-leash area include a huge bathroom, a small covered area with a picnic bench inside the big dog area, a bench to sit on in the small dog area, a poop bag dispenser (see below) and two trash cans to put your dog poop in. There was a poop bag dispenser in the small dog area (we didn’t go into the big dog area but I assume there is one there too) but it was clearly stocked by visitors who leave their plastic grocery bags. I wouldn’t count on there always being bags in there so I would come prepared with your own. There are other options for you and your dog at the park besides just the fenced off-leash area. If your dog likes to swim, there is a very small, non-fenced off-leash lake access along the shoreline of the lake. We walked the short trail down to the water to check it out. It seemed like a good area because there was a nice slope into the water and the water was shallow (one to two feet deep near the shore). There are also several on-leash trails at this park so YOU can get your exercise too. There is a wide, gravel, 2.5 mile path that goes around the lake. We couldn’t tell for sure but it looked like it was pretty flat. If you were looking for a more rigorous hike, you could explore one of the several trails on the hill to the southwest of the lake. 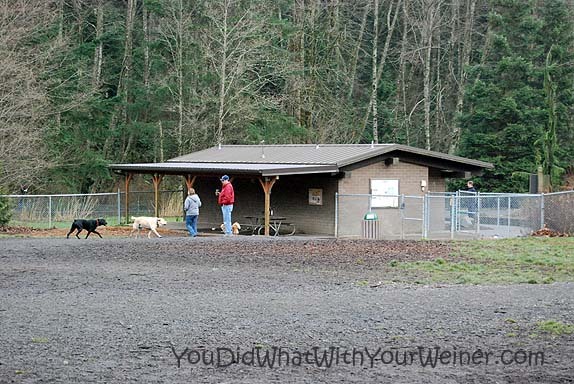 The bottom line is that we liked this off-leash dog park. However, it could be lonely for a small dog in the winter and you may have to walk a bit to get a parking space in the summer. We appreciate the big bathrooms for us humans but you should bring your own doggie poo bags to be safe. We look forward to going back to this park again to walk the trail around the lake. That sounds like a fun place to go and play – you made me laugh when you said the pups were barking at the big Dogs from the other side of the fence!! When I was little I was allowed in the small Dog side, now I have to go and play with the big Dogs – I think I’d prefer to come and play with you two though!! 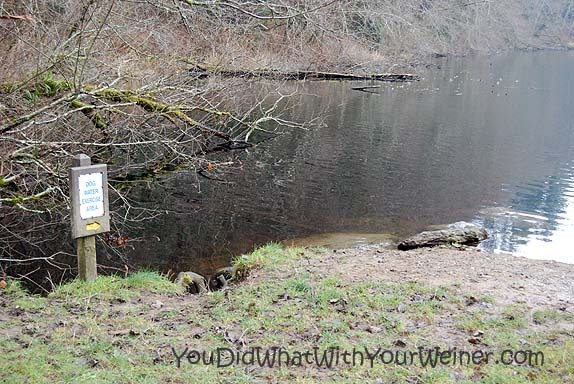 Lake Padden, Bellingham sounds like a great place to bring your dogs for some fun time with no leash on. I’m like you I would have stayed in the small dog area if in the big dog area they were playing to rough. Our dog is 12 years old and can’t get around so well and I wouldn’t want her to get hurt. I like how they had a little swimming area for them to. Our lab still loves to swim. Hope you guys had a great time. That sounds like a nice park. The lake access area for dogs sounds wonderful! Thank you for helping us find a truly wonderful place to take our dog, and with lake access! Great place!